Join us July 21-27, 2019! 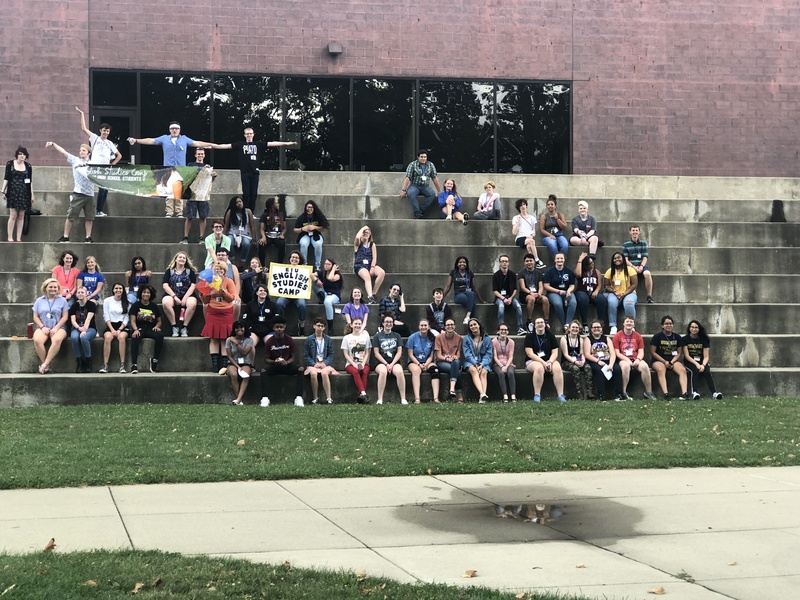 Eastern Illinois University will host the English Studies Summer Camp July 21-27, 2019. We look forward to welcoming high school students who share our love of reading and writing for years to come. This one-week camp allows students to hone their English skills while providing them with a chance to sample life on a college campus and meet peers with similar interests. Offering courses that reflect students’ interests, our engaged faculty and tranquil setting provide that perfect opportunity for students to have an academically charged summer getaway where they can grow as readers, writers, debaters, and English scholars! The EIU English Studies Summer Camp is a unique program that allows students to customize their program of study, selecting two sessions from a range of offerings in creative writing, literature, professional/academic writing, media studies, and more. Students grow academically and socially as they prepare for college and are mentored by expert faculty who share their passion for reading and writing. Students receive individual attention through small class sizes and gain skills in analyzing and crafting texts and expressing their ideas both verbally and through writing. a commuter rate which includes tuition, some recreational activities, and daily lunches. Scholarships for full or partial funding are available. What will you experience at the English Studies Summer Camp? Check our more of the highlights from the 2015 summer camp. Visit our 2016 summer camp photo gallery. Visit our 2017 summer camp photo gallery. Visit our 2018 summer camp photo gallery. See sample student projects: Ghosthunting Podcast, Queering Fairytales Zine, Marvel vs. DC Video Trailer. Students will enroll in a morning and afternoon course from the various course offering seen below. You can read longer descriptions of each course here. Rhyme & Rhythm: Who Could Ask For Anything More? Camp participants will enjoy a range of fun recreational activities starting with the Welcome Pizza Party (an informal meet-and-greet for students and faculty) and ending with the Student Showcase (a public reception where students share their work with their families and the community). When not in class, students will participate in indoor and outdoor games, movies, picnics, karaoke jam sessions, slam poetry readings at the local coffee shop, and more. EIU admissions and campus tours will be available by appointment on the last day. Living, dining, learning, and socializing together, students will have the opportunity to form lifelong friendships. Along with this application, submit a one-page essay explaining your interest in the program. Upon acceptance, submit payment online to reserve your spot in the camp. All applications and supporting materials must be submitted online by: May 15. Students will be notified of acceptance by email. (Note: no acceptance material will be mailed this year; all communication will be electronicly sent to the email address listed on the camp application.) Additional information, including a detailed program schedule and driving directions to campus, will be sent to all students at this time. Confirmation of camp attendance, required paperwork, and payment will be due by June 10. All payments must be paid through the online payment portal. We are pleased to offer a variety of full and partial scholarships designed to recognize high achieving students and allow students demonstrating financial need to attend this camp. Notification of scholarships will be included with the notification of acceptance into the camp. To apply for a scholarship, complete the online scholarship application. Residential Rate: $295 – includes tuition, supervision, program materials, housing, and meals. Students stay in university residence halls and receive cafeteria-style meals served in the campus dining halls. Students will check in at registration on Sunday late afternoon prior to the opening celebration and will check-out on Saturday early afternoon following the closing reception. Students and families will have the option to attend pre-arranged campus appointments (e.g. admissions, campus tours) in the late afternoon. Commuter Rate for Local Students: $195 – includes tuition, program materials, and daily lunches. Commuting students will check in at registration on Sunday late afternoon prior to the opening celebration and thereafter must arrive on campus by 9 a.m. for classes Monday-Friday and depart campus by 5 p.m. Students will also attend the closing reception on Saturday morning and have the option to attend pre-arranged campus appointments in the afternoon (e.g. admissions, campus tours). Extended Stay/Supervision for Campers Arriving by Train: $40 - we are happy to provide additional supervision, meals, and entertainment for campers needing early arrival and late departure due to travel via Amtrak. Campers requesting this should book the train arriving at Mattoon at 11am on Sunday prior to the start of camp and departing at 4pm on Saturday after the end of camp. Camp counselors will provide transportation for these campers as well as meals and activities. This additional fee covers the costs for the extended camp attendance. Student Cancellations: Refunds will be made for cancellations received by June 30. 50% refunds will be issued for cancellations received from July 1-July 10. Sorry, no refunds will be issued after July 10. All payments must be made online at https://commerce.cashnet.com/eiuengl1. An acceptance letter from camp director Dr. Melissa Ames will be sent to all accepted campers electronically by May 31 along with important paperwork that must be completed by June 10 and submitted online. In case you lose these forms, there are links to all four of them below. (Note that print/scanned or electronic/typed signatures will be accepted on these forms.) If you do not receive an email concerning acceptance by June 5, please contact Dr. Ames to inquire about the status of the application. Between now and the start of camp, we encourage you to RSVP for the showcase brunch and campus tour and/or admission appointments. Links to the RSVP forms are below. You can also learn more about the camp faculty and counselors from the faculty and counselor biographies. Paperwork must be submitted by June 10 through this link. Eastern Illinois University is located in the city of Charleston in Central Illinois. Charleston’s historic setting, country charm, and tranquil scenery, coupled with the trademarks of a typical college town, make it a perfect backdrop to enjoy a week studying one of your favorite subjects and meeting students who share your interests. The campus is conveniently located between three metropolitan areas: 2 hours from St. Louis, 2 hours from Indianapolis, and 3 hours from Chicago. With a train station one town over and airports just an hour or two away, transportation to and from campus is easy. For Further General Information, please contact: The English Department Office, 600 Lincoln Avenue, Charleston, IL 61920. Phone: (217) 581-2428. Fax: (217) 581-7209. Email: mames@eiu.edu. For Specific Information about the Program Schedule or Sessions, please contact: Dr. Melissa Ames, Program Director via email at mames@eiu.edu.